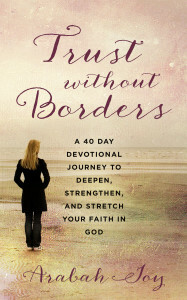 Trust Without Borders is a vulnerable and compelling 40 day devotional intended to deepen, strengthen, and stretch the reader’s trust in God. This unique devotional is story- driven, taking the reader on a magnificent journey from leafy suburban America to the chaotic streets of Asia. Trust Without Borders is a vulnerable and compelling 40 day devotional intended to deepen, strengthen, and stretch the reader’s trust in God. This unique devotional is story- driven, taking the reader on a magnificent journey from leafy suburban America to the chaotic streets of Asia. Part memoir and part spiritual guide, Trust Without Borders gently weaves biblical truth with life’s everyday situations, from the daily mundane of dishes and laundry to helping a needy stranger on a crowded subway. The result is an invitation for you too to see every aspect of your life as an opportunity to trust God, an invitation to trust without borders.